Creates an in-place edit with the given text. A widget that provides in-place-editable text. The WInPlaceEdit provides a text that may be edited in place by the user by clicking on it. When clicked, the text turns into a line edit, with optionally a save and cancel button (see setButtonsEnabled()). When the user saves the edit, the valueChanged() signal is emitted. 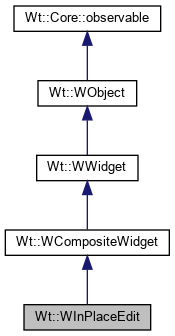 A WInPlaceEdit widget renders as a <span> containing a WText, a WLineEdit and optional buttons (WPushButton). All these widgets may be styled as such. It does not provide style information. The first parameter configures whether buttons are available in edit mode. This method returns 0 if the buttons were disabled. You may use this for example to set a validator on the line edit. Displays the Save and 'Cancel' button during editing. By default, the Save and Cancel buttons are shown. Call this function with enabled = false to only show a line edit. In this mode, the enter key or any event that causes focus to be lost saves the value while the escape key cancels the editing. Returns the WText widget that renders the current string. You may use this for example to set the text format of the displayed string. Signal emitted when the value has been changed. The signal argument provides the new value.